This is a quick post, in line with how quick this recipe is. 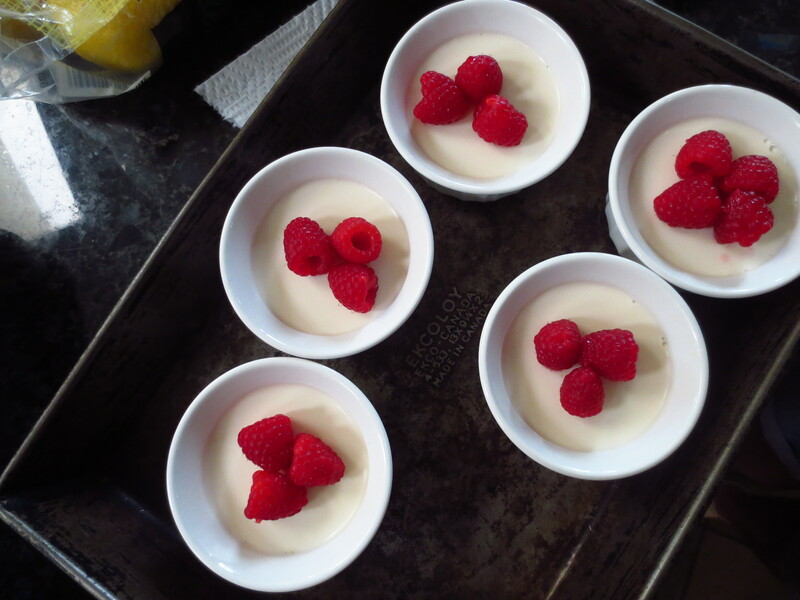 Panna cotta is the perfect summer dessert. It takes almost no effort to make, minimal preparation, and pairs with almost any fresh ripe summer fruit. You could do peaches, raspberries, cherries, apricots…pretty much anything. 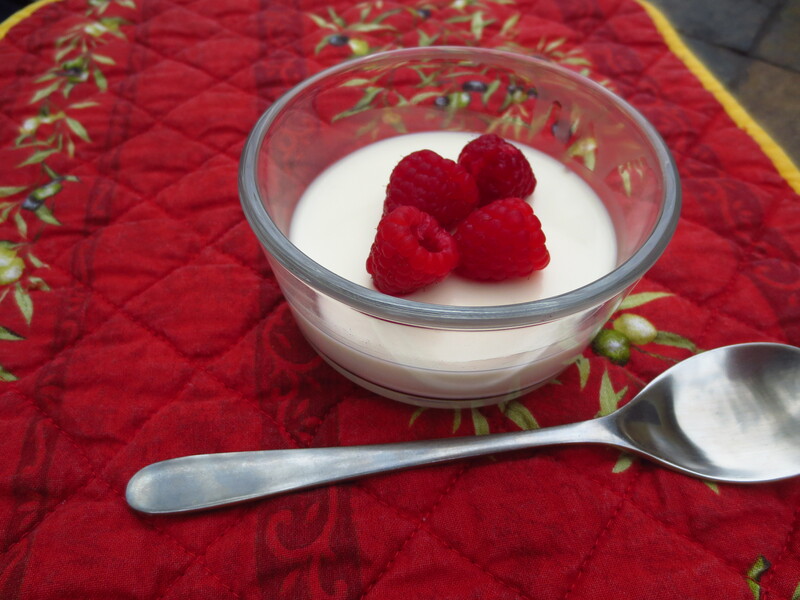 I like raspberries the best because they crush up easily and make their own sauce as you spoon up the creamy panna cotta. 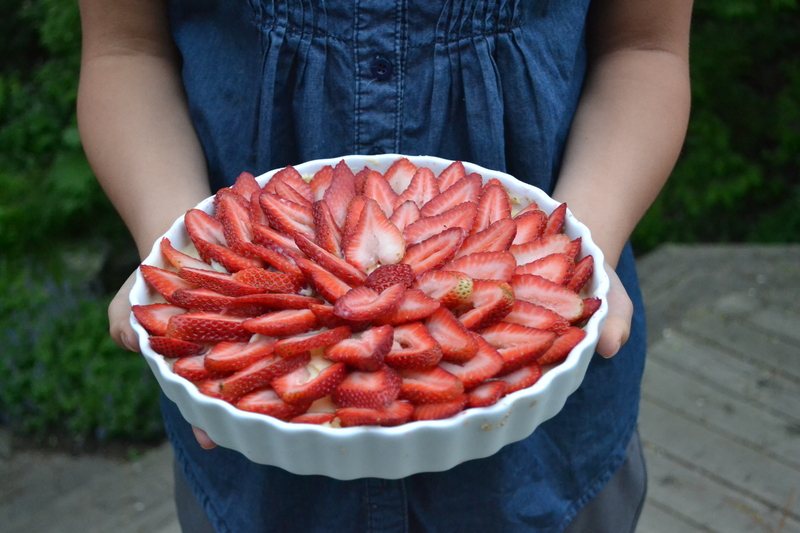 I made this dessert in a panic during Stampede when I realized that in between Stampede breakfast hopping, free concerts, Bollywood dancing, and fireworks I had no time to make a fabulous pie or cake for the BBQ that night. 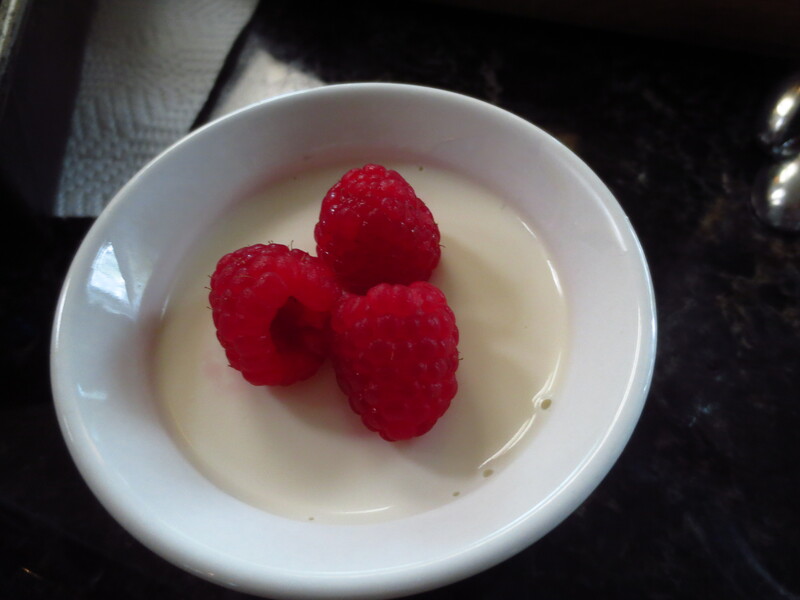 Once again, panna cotta saved the day. 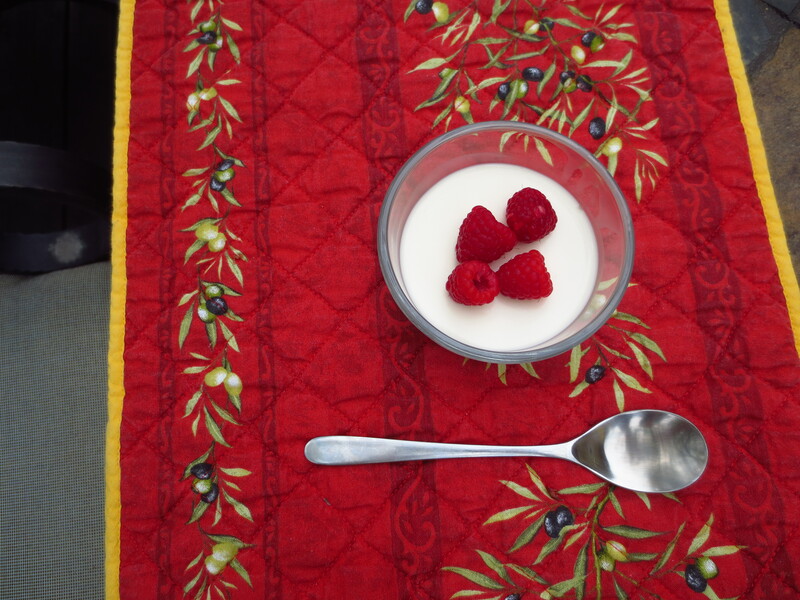 So heat up that milk, dissolve that gelatin, go out and enjoy the sun, come back a few hours later to delicious cold and creamy Italian milk pudding. You can make them up to two days ahead and keep them well-covered and chilled. For gelatin-related questions, read my Tips for Using Gelatin. You can find instructions for using sheet gelatin at the end of the recipe. If you’re pressed for time, pour the Panna Cotta mixture into wine goblets so you can serve them in the glasses, without unmolding. 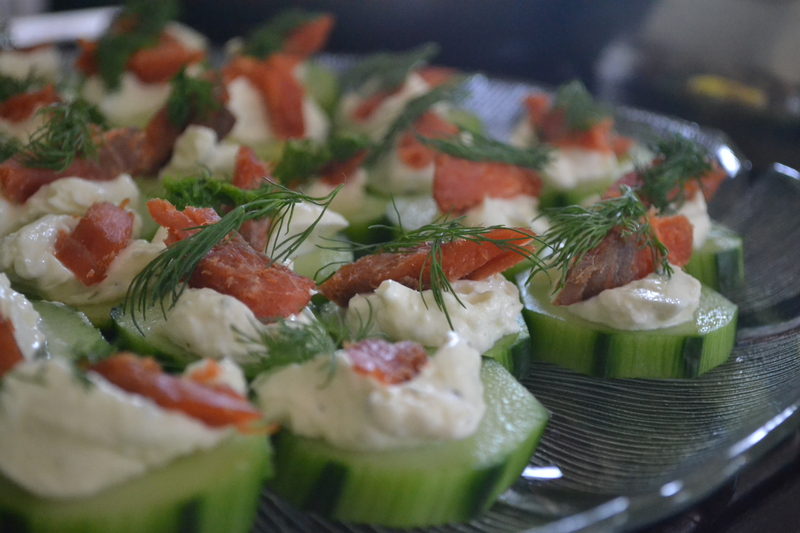 This is one of the first recipes that I can actually call my own and I’m darn proud of it! It’s so much easier to spontaneously throw together dinner or lunch without a recipe, not so much with baking. 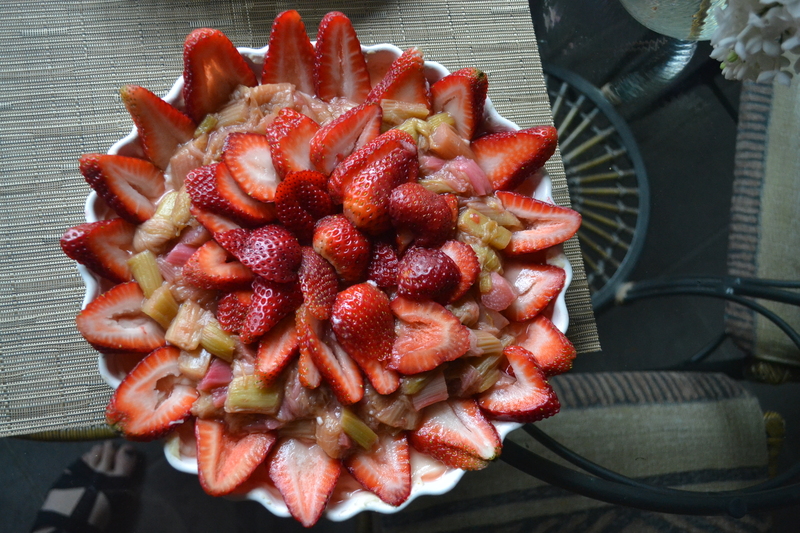 I was inspired by the rhubarb sundae at Earth to Table Bread Bar and it was the perfect dessert for a spring potluck. Sadly, the occasion was a going-away party for some of my parent’s closest friends that are retiring to island life in British Columbia. The entire night everyone reminisced and told crazy stories while passing salad bowls, mixing rhubarb cocktails, and feasting on dishes made with love. 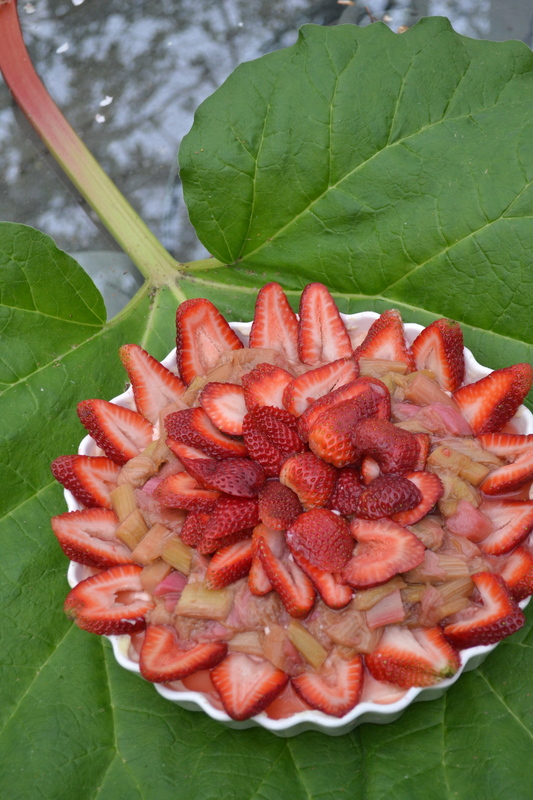 I started with the essential spring vegetable/fruit rhubarb, correctly categorized as a “herbaceous perennial”, more usefully categorized as “confusing red celery plant that gets put into desserts instead of salads”. My mother loves rhubarb and we’ve been poaching harvesting from our neighbour’s garden since we moved into the neighbourhood. If you ever saw two Asian women in the rain waving large chef knives in the garden, it was definitely my Mom and I. Plenty of cars passed by and slowed down as we hacked away at the crimson stalks, safari style. Rhubarb is quite tart and most people add cups of sugar to balance that fresh pucker-inducing flavour. Sometimes people go too far and make it sickly sweet – what’s the point of even using rhubarb if you’re drowning it in sugar? Rhubarb is quintessential spring – it should taste fresh above all else. 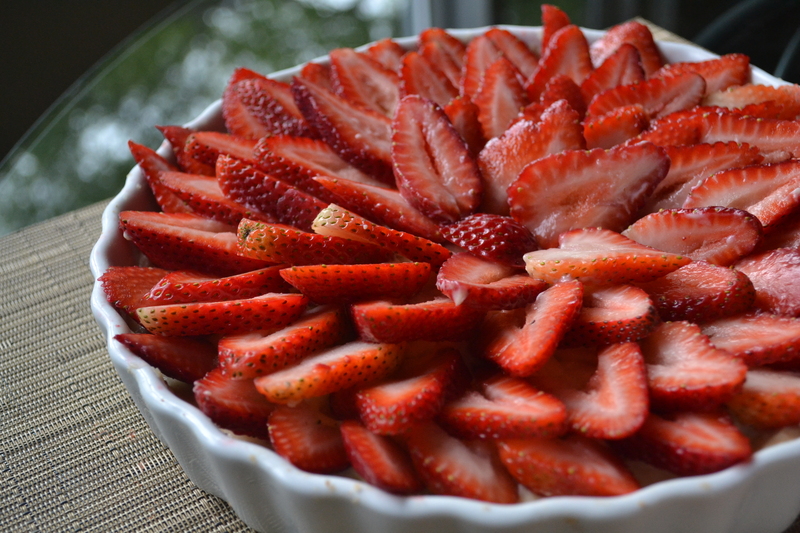 Adding strawberries to sweeten is much more appealing, in my opinion. Not everyone likes rhubarb though – it’s definitely an acquired taste. After years of rhubarb pies and compote I’m a fan for life, but just in case I decided to make a Strawberries + Cream version of the pie as well. It worked out deliciously with the rich vanilla pastry cream and the thick, nutty oatmeal crust. You could even use the oatmeal + fruit combo as an excuse to eat it for breakfast. Bake the crust and make the pastry cream first because both components need to chill. While they’re in the fridge you can prepare the fruit. 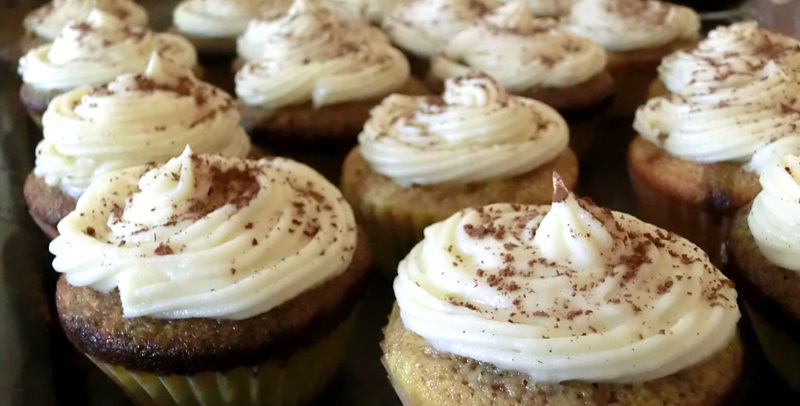 The pastry cream is finicky part of this recipe, everything else is easy! Feel free to add more crystallized ginger, you need quite a bit of it before the taste actually comes out. Mix oats, flour, cinnamon, crystallized ginger, sugar, and vanilla together in a large bowl. Pour melted butter over mixture and stir until completely combined. Press mixture into bottom and sides of pie plate (makes either one very thick crust or two normal crusts) and refrigerate until ready to use. Bring milk to boil in small saucepan. Meanwhile, in a heavy saucepan, whisk the yolks together with the sugar and cornstarch until thick and well blended. Still whisking, drizzle in about 1/4 cup of the hot milk – this will temper (or warm) the yolks so they won’t curdle. Continue whisking and slowly add the rest of the hot milk. Put the pan over medium heat and whisk vigorously, bringing the mixture to a boil. Boil for two minutes whisking continuously and remove the pan from the heat. Whisk in the vanilla extract. Let sit for 5 minutes, then whisk in bits of the butter, stirring until it is fully incorporated and the pastry cream is smooth and silky. Scrape the cream into a bowl and create an airtight seal with plastic wrap and refrigerate until cold. If you want it to cool quickly, put the bowl into a larger bowl filled with ice cubes and cold water, and stir the cream occasionally until it is thoroughly chilled, about 20 minutes. Trim both ends of the rhubarb stalks. Cut the stalks in 1-cm (1/3-inch) slices, unless they are pencil-thin, in which case you should cut them in 2.5-cm (1-inch) segments. Put the sugar and 500 ml (1/2 quart) fresh water in a medium saucepan. Split the vanilla bean lengthwise with a sharp knife, scrape the seeds from the inside of the bean with the dull side of the blade, and add them and the bean to the pan. Bring to a simmer, stirring regularly as the sugar dissolves. Add a quarter of the rhubarb to the simmering syrup — resist the temptation to add more, the rhubarb won’t cook evenly if the pan is crowded — cover, and allow the mixture to return to simmering point. Once the syrup simmers, cook for just 1 minute, until the rhubarb pieces are soft (test with the tip of the knife, it should meet minimal resistance) but still holding their shape. Remove the rhubarb with a slotted spoon, leaving the syrup in the pan, and transfer to a serving dish or container. Repeat with the rest of the rhubarb, one small batch at a time. Add the syrup and the vanilla bean to the dish. 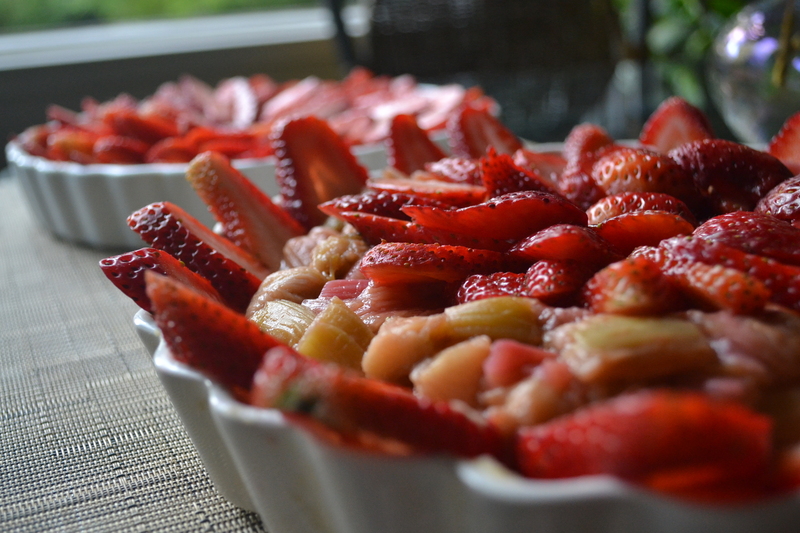 Top with sliced strawberries and poached rhubarb, chill or serve immediately. So I’m going to try to do something completely new on this blog – restaurant reviews! Because let’s be honest – I ate my way through Eastern Canada. My first stop surprised pretty much everyone, including myself: Hamilton, the city with the most waterfalls per capita! My friend M. goes to med school there and he convinced me, despite warnings of the “industrial wasteland” from others, that he would show me a good time in Hamilton. In between shenanigans I got to explore Hamilton on my own and I discovered one of my favourite streets: Locke St. How could you not love it? It has a tea parlour where you can have high tea in a garden patio for only $15! An artisan cheese shop doubling as a design showcase with reclaimed wood cutting boards. I ended up at Earth to Table, the last restaurant on the street. The interior is bright and quirky with menus written on chalkboards and plenty of tables in front of the sunny windows. Everyone from families to couples were eating hearty lunches there and I instantly felt at home. 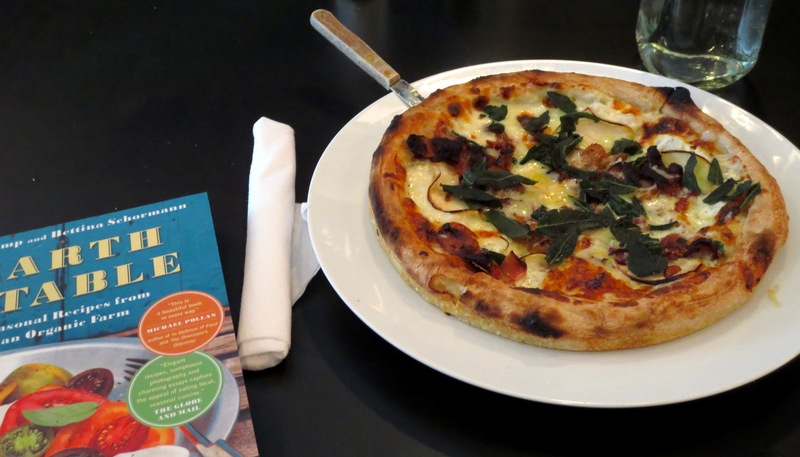 Seasonal, local, and quirky options on the menu included quinoa burgers, porchetta sandwiches, a spicy tomato pizza with lemon ricotta, honey, and hot peppers. Apparently pizza is what they are known for so I went with the Apple and Bacon pizza. 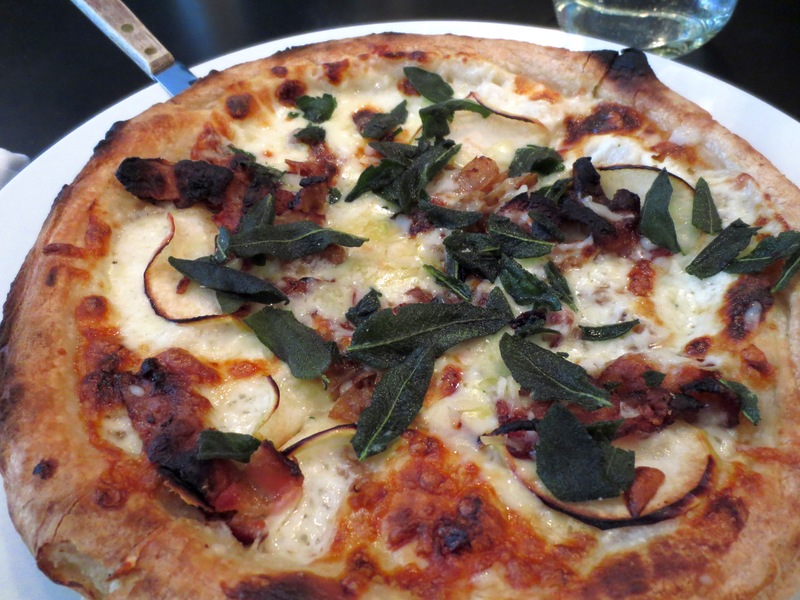 It was Neopolitan-style pizza dough with bechamel sauce, caramelized onions, smoked cheddar, sage, sliced apples and bacon. 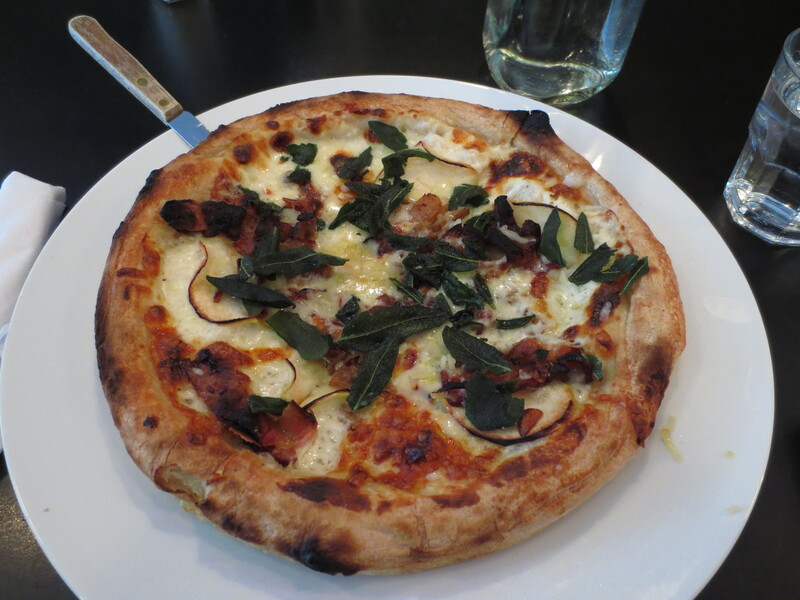 The pizza was hearty with lots of interesting textures, between melty cheese, crispy sage, salty bacon, and refreshing apple. It would have been nice to have more apple slices to cut the saltiness of the bacon and cheese. The crust was a little thicker than most Neopolitan pizzas but it worked with the generous toppings. For dessert I had the Rhubarb & Ginger Sundae which became the inspiration for a summer pie later. 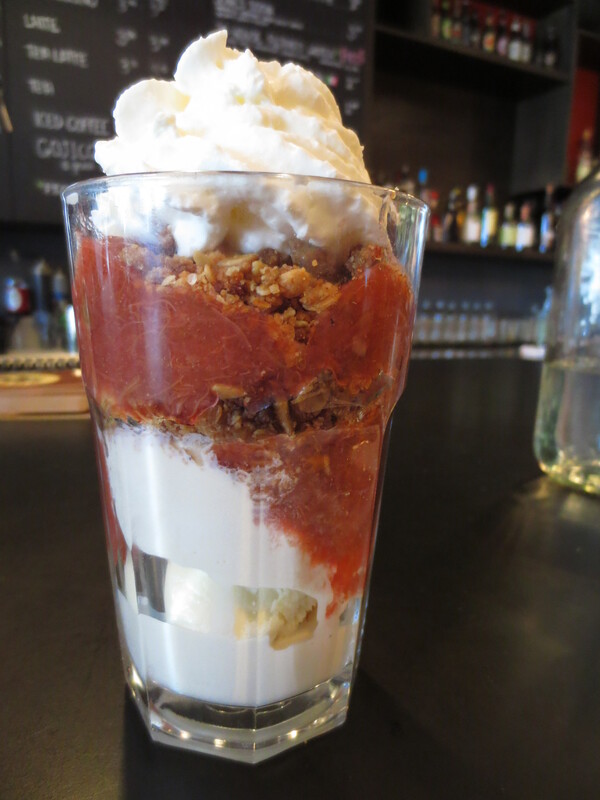 Scoops of creamy vanilla ice cream layered with oat crumble, crystallized ginger, fresh rhubarb compote, topped with a cloud of whipped cream. I have an aversion to ginger so I was slightly apprehensive, but I couldn’t distinguish it between the toasty nutty oats with the tart saucy rhubarb. 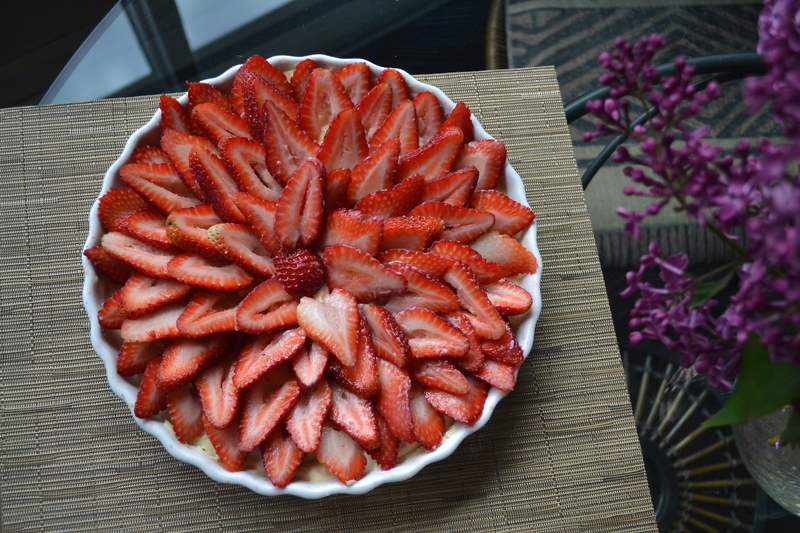 Fantastic spring dessert! I would definitely eat here again. The promise was delivered; between singing our hearts out to Cher to re-living prom at the Med Formal and tasty pizza I had a fantastic time in Hamilton!